When people decide to come to me for help, as a personal trainer, it's usually because they feel like they need to lose weight. Often that is accompanied by wanting to get stronger, feel healthier, and even be a role model to their children. When you set up a goal for yourself, you need to have ways to measure your progress. How do you monitor that progress then? Generally speaking, people like to focus on numbers. But I believe that we should focus more on our incremental progresses. Not an idea of perfection, but continual progress. Things we forget to pay attention to, but that add up to mean so much more than a number. It's sort of like remembering to focus on those little things, those little moments each and every day that make up our day. 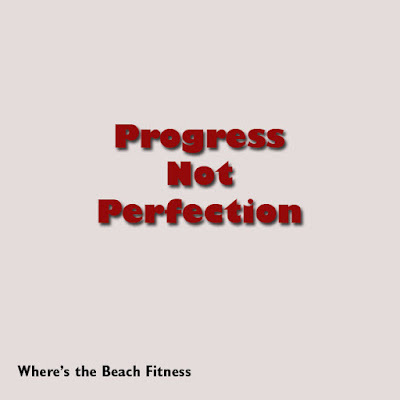 I think focusing on progress vs perfection helps too because it's not a linear process. There are always steps forward, back, and sometimes seemingly staying firmly planted. But when you break it down into something looser than a number, you can start to see the changes, the changes that matter far more than any number. How do you feel over all? What are your family and friends saying? Do you feel stronger, more energized? For runners I would ask how they feel about their endurance, is it getting easier, are they getting faster, more confident. What about someone like me trying to grow my business? Or maybe it's someone like you. What ways can we measure that progress other than monetary numbers? I think it's engaging with new people, learning learning and more learning, enjoying the process, feeling more confident, becoming an expert (e.g., your friends asking for advice). Basically, it's all about the progress, the journey and recognizing those "little" improvements, moments. Not letting ourselves become overwhelmed with this notion of reaching for perfection. Come one, we all know that doesn't exist. Let's focus on something that matters more, it'll certainly keep you more motivated! Do you do well with focusing on your progress vs trying to reach for perfection? How do you measure progress in ways other than numbers?